Current Itinerary: We arrived here today from Panajachel which is also on Lago Atitlan. We’ll probably try to get to El Salvador by this weekend and spend about 4 or 5 days there before we head to Honduras to meet up with Jodi’s mom, who is coming to visit us on May 1! Note#1: I know these journals are coming at a trickle but at least they are coming! I wasn’t feeling too well most of the last week and couldn’t get the motivation to do much besides sleep. I’m back at 100% now and we are on the move again. Note #2: We diverted our path a little due to the timing of Jodi’s Mom’s visit so we will leave Guatemala this week. We’ll come back to hit Rio Dulce and Livingston in a few weeks as we’ve heard from many that they are can’t miss stops. I’m also happy to report my buddy Gavin is coming to visit at the end of May. Feel free to follow suit everybody! We love visitors! We cleared Belize customs at about 2:30 in the afternoon and we were headed to Corazal to get a ferry to Ambergis Caye (pronounced “key”). On board the bus, we were actually sitting behind a guy who turned out to be a Belizian cop. He gave us some important advice about crossing the borders down here. Apparently it’s pretty common for drug dealers/traffickers here to sit behind people on the bus and stuff drugs into an exposed pocket on your bag or backpack to get it across the borders. Just spreading the word for other travelers out there that might read this...make sure you keep in extra close eye on things when you get close to the borders. Afterwards we found out we were luckier than we thought...there are only two ferries per day...one in the morning and one in the afternoon. We would have been stuck in Corazal overnight had we not narrowly caught that ferry! I must be carrying some sort of talisman because this has happened to me about 300 times now...just barely catching the next bus/boat. Hmmmm...I never seemed to have that same luck when catching the subway in Boston. During the 2 hour ride to San Pedro we met the other American couple, Trever and Emma/Denver who had really come a long way that day...they had left Colorado that morning, flown into Cancun and made their way all the way down to Belize, barely catching the boat with us. That is a long day! We thought we had gone through a lot just getting from Chetumal! Anyway, they were a nice couple and were only going to be in Belize for 10 days so not losing a day in Corazal was even more important for them. When we got to the island, it was nothing like I expected at first. Almost everyone we talked to said that the island was full of resorts and it was very expensive...we did not see any of that where we got off near the pier...it seemed like a pretty run down place with uneven dirt roads and people riding bikes around in every direction. As we walked along, we did not see any other tourists around but one nice thing was that nobody was harassing us at all...not one person tried to sell us anything or get us to stay in their hotel. It was nice actually and a good change from always trying to get hustled in Mexico when you’re walking around with your pack. We wandered around for a while and couldn’t find the place we were searching for but stumbled across another place called the Bayside Pointe...which sounds more glorious than it was but it was pretty cheap (only US $25) and later after looking around a little we learned it was probably the cheapest place to stay on the island. It also had a bar on the water that was down the street from the part we stayed in...but the place was really nice (Here is a video of our room and the hotel). They only just opened it at the beginning of this year so I don’t think many people know about it but it was great and tucked away on the backside of the island where pretty much only locals are around. 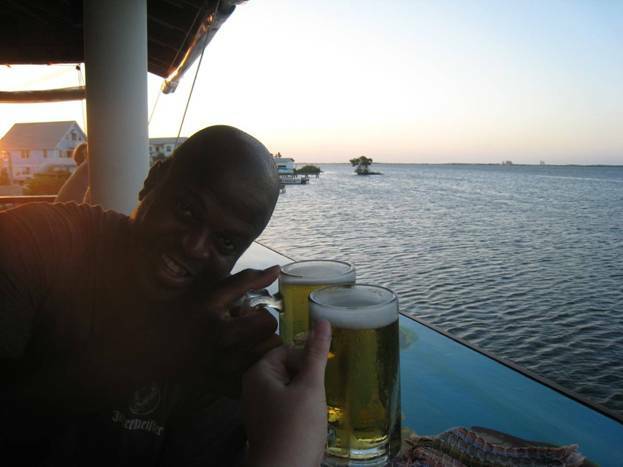 We went up to the bar to have our first Belizian beers and grab a bite. The Belizian beer called Belkin is actually really good...about 100 times better than any Mexican beer, that’s for sure (with the possible exception of Indio, which Mexico inexplicably doesn’t export). We met a few people from the Boston area at the bar...older couples that said they were staying on a different part of the island in a resort. Hmmm...I guess we needed to explore, because from what we had seen at that point, nothing about this place says extravagance. After eating we went to see what this place is really about...and the answer is...GOLF CARTS!! I’m telling you, there were golfcarts zipping around everywhere. The narrow streets are mostly unpaved (except for the main drag) but the island is large enough that people need someway to get from place to place...regular cars would be too big and fast so they use golf carts here to get around and the island is jam packed full of them. In fact, every other store here is a place to rent golf carts. The main 2 roads at the front of the island were drastically different from the backside that we had seen up to that point. There were many more people and tons of tour places and dive shops. There were also several restaurants and many small hotels and pousadas, but it was packed in pretty tight and I did not see where there would be space for any of the large hotels or resorts that we had heard about. Despite that, there did seem to be a fair amount of foreigners. We would later learn that the inhabited part island stretches on for some 20 miles and most places are a boat or golf cart ride away from the center...thus all the golf carts. After strolling around for awhile we ended up at a bar called Jaguars where we ended up meeting a “local” guy named Keith from England. I call him a local because he had actually been living on the island for 4 years, working at the Captain Morgan’s resort. Here was a guy who had led a pretty tough life! 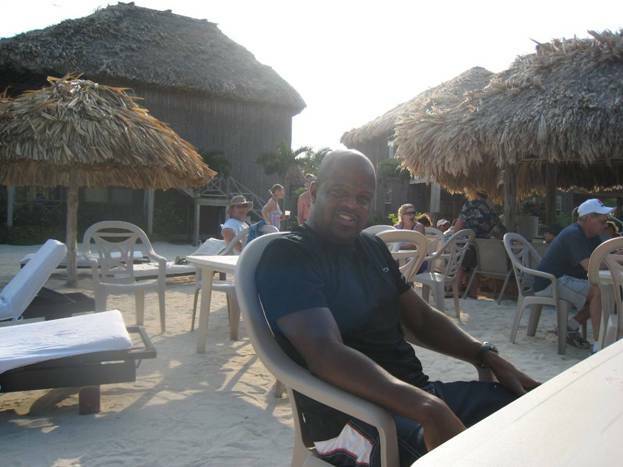 Before moving to San Pedro, he lived in Grand Cayman for 5 years working at and running a bar. Not too shabby! We sat there for a couple hours talking and having more Belikin beers and even taking in an NBA game that was on the TV in the bar...in English! I don’t think I realized it but the first language here in Belize is English...they also speak creole as well but nobody really speaks Spanish as you might assume since they are in Central America. Anyway, Keith invited us up to the resort the next day but said it was pretty far so we’d need to rent bikes or a golf cart...that was an easy choice for us. Incidentally, we got into a discussion about the golf carts in San Pedro and how many there were...and then Keith gave us the most stunning piece of information that I have heard in 2008...those golf carts cost US $12000!!! That is not a typo! TWELVE THOUSAND bucks for a freaking golf cart!! I have owned 4 cars in my life and the combined total I paid for all of them doesn’t even add up to that! On closer inspection I realized that these carts have a sophisticated suspension system installed and bigger tires to handle the rough, uneven roads but still...that is absolutely crazy to pay that much for a golf cart...but it seems that if you live here, it would pretty much be essential to getting around. Keith told us that outside of the initial cost, that much worse is the maintenance it takes to keep them running on these horrible roads and battling corrosion from all the salt and sand. No wonder the people are so poor here...they are dumping every penny into their golf carts! Since Keith knew a lot of people, he called up a guy he knew that would do the diving certification with us...but that turned out to be WAY more expensive than we thought...US $400! We were expecting it to be cheaper than Cozumel, not that other way around! I guess that is going to give us something to think about...perhaps it will be cheaper in Caye Caulker...who knows. We talked about it as we headed back to our hotel around 12. We got up and went to the internet place so I could get a journal out and then we walked around finding out about doing a few tours and seeing if we could find a cheaper place to do the diving certification. We had no luck on that front...but we did have the entire process explained to us and we knew what our options were...we decided that for sure it would not be any MORE expensive in Caye Caulker so we figured we’d wait until we got there to do the certification and just do some snorkeling and hang around San Pedro for a day or two more. We went to rent some bikes so that we could get around a little easier and we set off to find the Captain Morgan resort that Keith worked at which was supposed to be a few miles away. We started off riding along the beach area but it was rough going...there was a lot of seaweed in the way and at times there was just a tiny path between trees. The beaches here in San Pedro don’t really lend themselves to swimming...although there are several long piers you could walk out on to take a dip, but it’s not like you have an area where many people are hanging out sunbathing and swimming. I guess people come here for the snorkeling and the diving, which is supposed to be spectacular, rather than to just hang out on the beach. We decided to head out to the main road but that was not much better for bike riding...there were huge holes everywhere in the unpaved road and big puddles that were tough to get around. There were so many rocks and holes it made me wonder how any vehicle could get around on these roads...even golf carts. No wonder they cost $12000! There is no way you could drive a regular car down these roads. Our other impression was that the island wasn’t really that remarkable. I can’t believe that Madonna wrote that song “Isla Bonita” about this place...after riding along for a few miles we were really not that impressed. It was very undeveloped, which is fine but it was not very attractive and it definitely was not what we were expecting from the way some people had talked about it. I guess maybe if it’s all you ever saw of the Caribbean you might be pretty impressed...but I’m not quite so sure. Perhaps I’ve been desensitized after spending all that time in the Mexican Caribbean. Either way, I don’t know why it’s considered such a luxurious island because there is very little to give that impression. We passed a few nicer hotels though and saw several under construction, so maybe things will change in the coming years, but they have a long way to go down here. Maybe that’s why we saw so many real estate companies back in the centro...it seems like many people are investing down here. Despite what we thought about the ride out, when we got to Captain Morgan’s, we were very impressed. It was a pretty nice little resort that had nice buildings that still had thatched roofs and they had been done with a hut like décor on the outside (see picture below). It kept in theme with the island and the region and was asthetically the best hotel we saw the entire bike ride. We eventually found Keith...it turned out that the resort also has several time shares and many people were there for their last night in San Pedro. Keith worked with the time shares but luckily he knew our situation (i.e. we have no money) so we were spared having to listen to the timeshare spiel...we still had a couple drinks though. We also and chatted with some of the other people who were there. They were in a far different world than us but everyone was really nice and we enjoyed rubbing elbows with the high class for a little while. 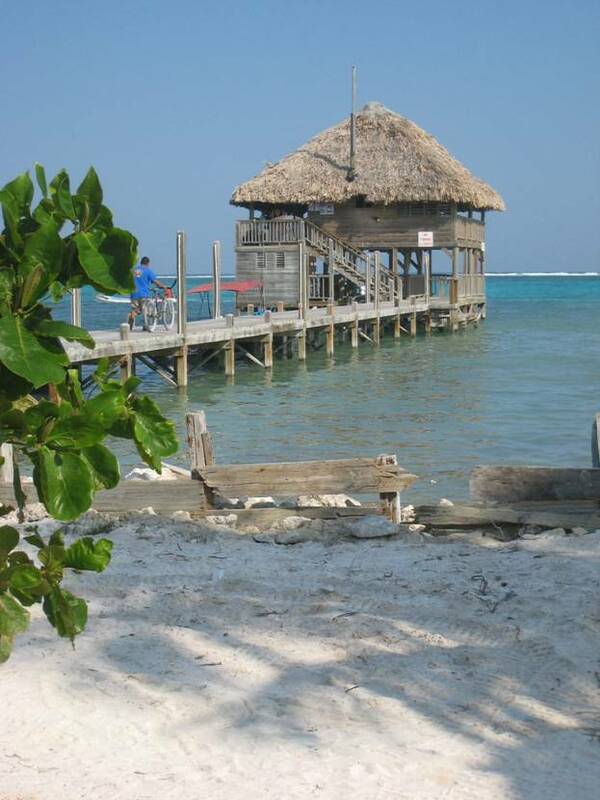 On the way back we stopped at this awesome place called “Palapa Bar” that Keith had told us about. You can see from the picture that it looks like a little hut out on the end of a pier...well, that’s pretty much what it was! It was one of my favorite little bars I’ve seen on my travels! We ended up sitting next to an older English couple at the bar and they really had traveled the world. It was nice to chat with them for awhile...I especially remember that they spoke very highly of the Cook Islands and it stuck with me because Karl had talked quite a bit how nice they were as well. It is definitely going to be a place I check out someday. It looked like there might be a storm rolling in so we headed back to our hotel before dark...but not before grabbing some wine and cheese along the way to have as a snack. We were actually thinking of going out that night but the storm rolled in before we could. It was probably one of the hardest rainstorms I have ever seen...lots of thunder and lightning. Luckily for us, despite all the wind and rain, the small deck area of our hotel was dry. We sat out on the porch and played cards and had wine and cheese for a few hours...it was actually really fun. There’s nothing like being dry and cozy when it’s pouring down rain outside. Later that night, since we couldn’t go out, we ended up watching our “21 Jumpstreet” DVDs on my laptop...that’s right the old Fox show from the early 90’s where Johnny Depp and co. go undercover in LA high schools! Classic. The DVDs were a gift from some friend’s of Jodi (sort of a long story)...we had a blast laughing our asses off watching them for a couple hours. Thanks Tuck and Kristen! It was very tough to sleep that night though as the storm was strong and persistent...the wind was blowing so hard that it was literally shaking our entire room and the bed...normally I have to pay 25 cents for that:) Seriously though, it was not easy to get through the night thinking that the whole damn hotel could blow away at any moment. The next morning it was very windy and cold and it was still raining pretty hard. When there finally was a short break in the rain we ran up to a nearby bakery to get some food. We were also able to drop off our laundry and then we headed for the internet place. We had planned on snorkeling that day but since it was cold and windy with off and on rain we had no real options. I think I’ve said this before, but that’s the downside of being in places like this...you are very dependent on the weather cooperating. We stayed at the internet place the whole day...the highlight was that I was able to chat with my buddy Dave online...it was my first real time contact with somebody from the US for almost a month. It felt good. Later we got pretty wet heading back to the hotel but since we had no food we stopped at the hotel bar for a couple beers and some nachos (in Suzanne’s honor). We met a cool local guy who told us about some ruins near San Ignacio called Cahalpech. They really sounded cool...later he showed us some pictures that he took and we decided we would have to hit it when we get out west. What was cool about this dude was that he was from San Pedro and had spent his whole life growing up here. He said that the first time he even ever left the island was when he was 12 or 13 (he was probably about 19 or 20 now). This island is very small...I could not imagine knowing nothing different for that many years (although, my hometown in Illinois is it’s on island in many ways). Anyway, Belize has many Mayan ruins that I’m sure we’ll be seeing some of as we travel on and most people here have seen many in their lives, but these ruins he showed us pictures of were the first he had seen in his life...you could tell it had a profound effect on him as he probably saw them on TV and heard travelers and other people talk about them his whole life. It’s nice...and a reminder that one does not have to travel very far sometimes to have their eyes opened to some of the beauties in this world. It also reminds me how fortunate we are to be doing something like this and be from a country that allows us the opportunity to be able to see so many other places. Anyway, it stopped raining again for a little while so we darted back to the hotel to change and then we rode our bikes back up to the center to the Jaguar bar. Keith had told us that the club next door to it was the hotspot for Saturdays so that’s where we ended up later that night. We had a great time dancing there and even our buddy who told us about the ruins showed up. Not surprising...it’s one of only 2 real clubs on the whole island. We danced like fools and headed home around 3:00...on our bikes! When’s the last time you ride your bike out to the bars!! Hahaha...good times! When we woke up at 10 we were not surprised to find that it was STILL raining. That was basically 30 straight hours of rain and it did not stop all day again. We were getting serious cabin fever as we were only able to escape the room a couple times that day to grab food (and we still got soaked). 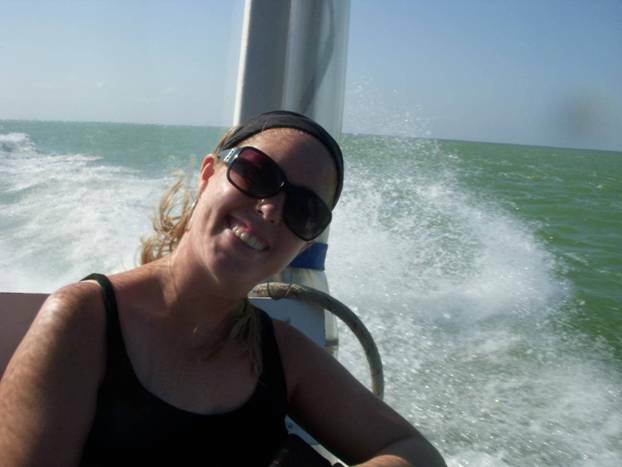 We were getting very soggy (we even had to change rooms that night b/c there was a huge leak and water flowing pretty freely into our room) and we were sick of the rain and cold so we decided to cut our losses and head for Caye Caulker the next day. 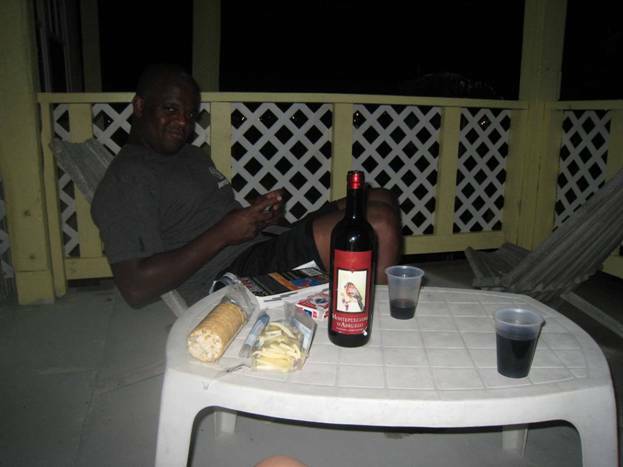 At least we had another nice wine and cheese night that night! We enjoyed some things in San Pedro but over all it wasn’t that great...admittedly, our bad luck with the weather was probably a factor. That’s how it is on the road though, every place can’t be a 10. At least we met a couple cool people like Keith and stopped and had a great time at the Palapa Bar and Jaguar’s. It’s also worth mentioning how lucky we are that this wasn’t a one week vacation for us in San Pedro like it is for so many...that would be brutal to have half your days taken away. We are fortunate that this is only the beginning of our time in Belize...I’m sure there are lots of great (and dry!) places ahead of us!